diamond and a Colombian emerald. Scientific researchers continue to prove the benefits accrued to people with healthy interpersonal relationships and wide-ranging social circles. Those blessed with multiple positive interactions tend to live longer, are less depressed, and even have fewer health problems in general. These emotional connections are often celebrated in jewellery design through symbols of friendship, love, and romance. Some are subtle and some more obvious, but all are entwined with the act of gift-giving. A simple circle or endless knot references the enigma of infinity‚Äîthe eternal nature of love having no beginning and no end. Jewellery is romance and fantasy in tangible form, and it‚Äôs this touchable concrete format that conspires to engage us all. ‘Toi et moi’ literally translates as ‚’you and me’‚ and describes two gems set at an oblique angle to each other usually in a ring design. It is also frequently envisioned hanging from a necklace at different lengths in a pair of pendants set en negligee. One absolute stunner from Birks is a ring set with an Asscher-cut fancy vivid yellow diamond paired with a similar shape and size Colombian emerald. 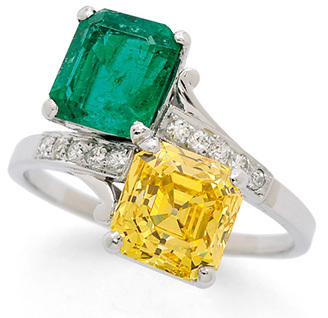 The voluptuous shade of green is a brilliant companion to the depth of colour in the yellow stone. In this well-established tradition, a mesmerizing combination of a lustrous natural pearl offset by a sparkly diamond was a particular favourite of the Edwardian period. Reminiscent of archery targets during the Edwardian era were rings designed with a large round diamond surrounded by a conforming border of small calibre-cut rubies, sapphires, emeralds, or onyx. The endless knot symbol for eternity is common to many cultures. 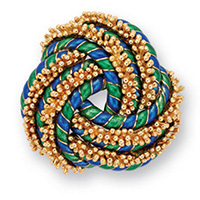 American designer David Webb created a love knot decorated with ribbons of tiny 18-karat yellow gold beads and contrasting blue and green enameling. Similar motifs are Gordian and Algerian knots, and the omega symbol from the Greek alphabet. Though unsigned, another more elaborate version of the endless knot is seen in a plaque of carved jadeite enhanced by diamonds. An Algerian knot pendant immortalized on film is conspicuously used as a prominent plot device to indicate a lost love in the James Bond movie, Casino Royale. Love knot brooch by David Webb in 18-karat gold decorated with blue and green enamel. Openwork links are the main feature of a Tiffany & Co., necklace from the ‘1837’ collection of rubedo metal and silver. Toni Cavelti designed a similar 18-karat gold necklace and dangling earrings. The pieces have an ethereal quality consisting of interlocking hoops of various sizes, some with a hammered finish and some smooth. Break down the separate constituent parts and all you’ve got is a bunch of openwork rings. The impact comes from massing them together in a visually pleasing manner. The overall effect is one of joyful abundance representing interconnectedness and the myriad large and small events in a lifetime. 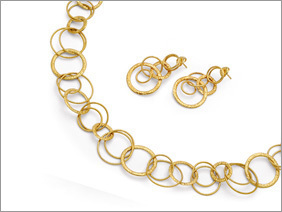 An 18-karat gold necklace and long dangling pendant earrings with interlocking hoops of various sizes by Toni Cavelti. Assuming you didn’t play hooky from math class the day they taught set theory, you’ll easily visualize the image of a Venn diagram connotes the intertwining of two lives. Intersection sets may not seem the stuff of romance, but art deco effectively meets mathematics in a platinum bracelet from the 1930s. The wide strap is decorated with pave-set and mine-cut diamonds in a sophisticated rendition characterized by a surprising juxtaposition of shapes the expected articulated rectangular panels alternate with and are softened by unexpected pairs of interlocking bombe circles. Who knew mathematics class contained elements of romance! A novelty example is an articulated platinum strap with a series of bombe X-motifs pave-set with round and baguette-cut diamonds in a fan pattern. It‚Äôs perfectly descriptive of the intention that someone‚Äôs a fan of your kisses. Wide art deco diamond and platinum strap bracelet with pave-set diamonds. Circa 1930s. Okay, so there may actually be only three shades of gold in the equally attention-grabbing and highly recognizable ‚ÄòTrinity‚Äô series from Cartier. Often referred to as a classic masterpiece, the extensive collection of tri-coloured gold intertwined bands that originated in 1924 extends to bangles, earrings, and pendants, too. Each colour represents a different aspect of a relationship: white gold for friendship, pink for love, and yellow for fidelity. From the same house come the ‘Menotte’ and ‘Love’ series. Complete with screwdrivers, they’re a modern riff on a pair of handcuffs and chastity belt, and so socially acceptable they can be worn in full view of your mother or maiden-aunt. There is nothing to be shy about when you have the Cartier marque on your side. Why not challenge the straightforward visuals and capture the imagination. Recurring themes of the universal language of love connections can fuse seamlessly and inventively when they’re finessed into something delightfully wearable. It’s a romantic way to bridge the gap in personal interactions during this age of communication via the remoteness of tech devices. In an era when it’s common to see couples sitting across from one another in a restaurant paying more attention to their texting than to each other, it’s encouraging to find every romantic symbol possible in a piece of jewellery. The survival of mankind may depend on it.